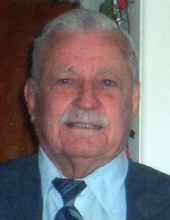 James “Jim” Smith died April 3, 2019 at the age of 90. Jim was born September 10, 1928 in Birthright, Texas to J.P. Smith and Agnes Petty Smith. Jim married Jean Smith on June 1, 1968. She preceded him in death August 26, 2016. He retired from the City of San Angelo Parks department in 1981. He used his skills from the Parks dept. to keep the lawn and gardens up for Day Memorial United Methodist Church for many years, giving back to his church. Jim lived at home until January 10, 2019. He was able to stay home even with dementia because of two special young men, grandsons Michael Owen & Kevin Hollis. Michael was right around the corner and kept a close eye on his Papa. Kevin’s weeks off he checked and visited with his “Pops” often. It was not unusual to find the three of them drinking a beer on Friday nights. They brought him many smiles. He was preceded in death by his parents, wife, brothers Jack and Buster, sisters Lela, Pet, and Mildred, grandson PFC Jason Poindexter. He is survived by his children Sam Poindexter, Sherry Owen (Randy), Rena Gipson (Kevin); grandchildren James Reeves, Robert Poindexter, Michael Owen, Nichole Woods, and Kevin Hollis; and nine great-grandchildren. A Graveside service will be 10am, Saturday, April 6th at Lawnhaven Memorial Gardens. Pallbearers will be the Grandchildren. "Email Address" would like to share the life celebration of James "Jim" Smith. Click on the "link" to go to share a favorite memory or leave a condolence message for the family.